My aunt and uncle, Lil and Jack Batchelder , lived at number 182 for many years from during the War to the early 1970s. Their neighbours for most of this time were Annie and Jim Game on one side and Mrs Larsen on the other. This photo dates from the 1950s. I am amazed at the amount of interest and debate that this photo has provoked! Having not looked at it in a while it was quite a surprise to see all your comments, suggestions and conclusions. All very interesting. I presumed the photo was taken in the 1950s as it has a postcard back and was posted in 1954, although of course the date the photo was taken could be earlier. The publisher is Bell’s Photo Co.Ltd., Westcliff-on-Sea. I haven’t been able to find the dates they were in business, perhaps someone will have better luck! Milton Gardens certainly had vehicle access, although it was a cul-de-sac. Post 1955 I spent many times visiting my good friend Dennis Barter who then lived on the corner of Feenan Highway and Milton Gardens (Number 32 I believe it was). His garden backed “into” Milton Gardens so they effectively had access onto the road. Comment for Cliff (my brother). Even at nearly 76 and in spite of a lifetime appreciating and promoting the benefits of good beer, my memory still holds out. A family trait I suspect. I’m certain that if anybody could peruse a pre-WW2 map of Tilbury (maybe a trip to the Library ) it will show that both of the 2 roads mentioned had access to Feenan Highway, the gable ends of the house’s of Spencer Walk face Feenan H’Way and were built forming an “L”. On entering Spencer from the Highway the road has been widen for parking which was originally a grass verge. I wonder at the interest that just one photo of by gone days has created, great reading. Could be Cliff!! So, would the photographic models, standing at the bus stops, please identify themselves and resolve this date issue? Andy it probably would’nt have helped, I expect all you would have seen is a “tax applied for” or a Guiness label. I notice that the kerb on the right of the picture leading to Milton Gardens and Swinburne Gardens appear to be lowered. I can’t quite make out if the kerb is lowered on the Spencer Walk entrance. Is it possible John that they were not open for cars but were accessible for bicycles? Well spotted with the LT bus stops Jim (You must be really old to notice such things). Isn’t it amazing what can be found out by scrutinising one picture. Some, but not many “H” TV aerials would suggest around 1952/53. The Coronation spurred on early sales of TV’s, although I recall not within the reach of many of the residents of Tilbury at that time! All we need now is for D.I. Reynolds and his Council contacts to confirm when the roads were cut through and we’ve really narrowed it down! Another clue could be that there at least three visible ‘H’ television aerials. They stopped broadcasting during WW2. Restarted temporarily in 1946. Stopped again in 1947 due to the national fuel crisis. Resumed again in 1948 with coverage of the Olympic Games in London. I don’t think that many people would have had TV until the 1950’s. Look at the bus stop signs. LT not Eastern National. When did LT take over the bus routes? Further investigation shows that LT started operating the 300 series routes in Thurrock in 1952. Therefore the picture must be post January 1952! I agree it’s almost certainly a Wolesley 10 and they were manufactured between 1939 and 1948 so the timing fits. You have started something here Hazel!! Why do you say 1950’s? Cliff and Percy are agreeing with you and I can’t fault their logic, but I don’t ever remember Spencer Walk not being a road, to ride through on my bike during the late 1940’s. I think the roads may have been ‘cut through’ for WW2 emergency vehicles, so I’m guessing early 1940’s for the photo. The car has front to rear opening doors and a running board which could be a Wolseley 10. These cars were built in the late 1940’s and were popular as police cars. I doubt that the car was new so I would think this picture was taken 1950’s. Just going by the style of the car in the foreground, the complete lack of traffic in the whole length of Feenan Highway and the way the lady at the bus stop is dressed I’d say early to mid fifties. Just an educated guess. Spot on with the location ID. 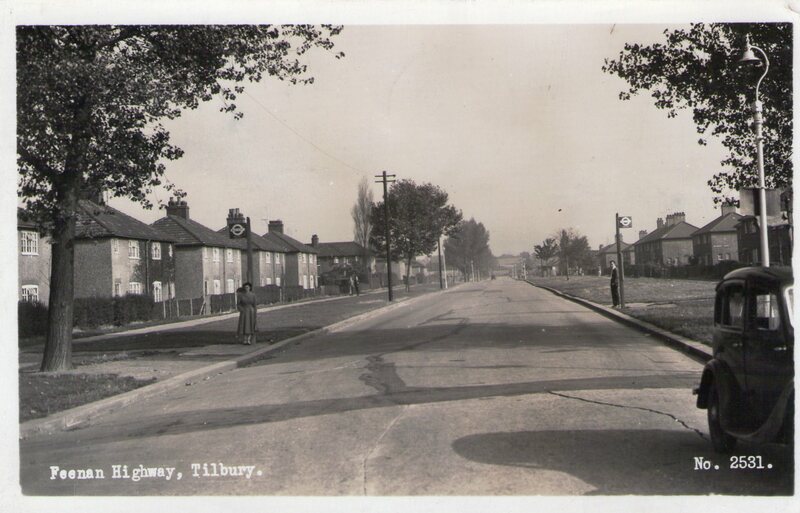 Enhance the photo and you see the “Swinburne Gardens” road sign on the right. Very observant D.I. Reynolds, well done.